Avi Vantage supports three techniques by which to scale data plane performance. To scale to well beyond native scaling’s limit (4 SEs), Avi Vantage also supports BGP-based horizontal scaling. Relying also on RHI and ECMP, this method requires some manual intervention elsewhere in the network to scale the load balancing infrastructure. See BGP Support for Scaling Virtual Services for details. During a normal steady state, all traffic may be handled by a single SE. The MAC address of this SE will respond to any Address Resolution Protocol (ARP) requests. 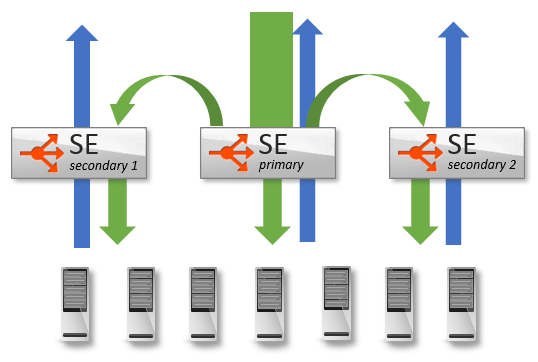 Once the new SEs are configured (both for networking and configuration sync), the first SE, known as the primary, will begin forwarding a percentage of inbound client traffic to the new SE. Packets will flow from the client to the MAC address of the primary SE, then be forwarded (at layer 2) to the MAC address of the new SE. This secondary SE will terminate the Transfer Control Protocol (TCP) connection, process the connection and/or request, then load balance the connection/request to the chosen destination server. For VMware, Docker, bare metal, Amazon Web Services, and OpenStack using Nuage environments, the secondary SE forwards packets directly back to the original client, as indicated by the blue arrows in the figure above. However, for OpenStack with standard Neutron, such behavior presents a security violation. To avoid this, it is recommended to use port security. For more information on this and the recommended practice, refer to Neutron ML2 Plugin. If the administrator wishes to take direct control of the manner in which an SE routes responses to clients, s/he can use the CLI (or REST API) to control the se_tunnel_mode setting, as shown below. The tunnel mode setting won’t take effect until the SE is rebooted. This is a global change. Protocols or virtual service features that consume significant CPU resources, such as compression or Secure Sockets Layer (SSL)/ Transport Layer Security (TLS). Concurrent connection counts that exceed the memory of a single SE. Scaling is different than high availability, however, the two are heavily intertwined. A scaled-out virtual service will experience no more than a performance degradation if a single SE in the group fails. Legacy HA active/standby mode - a two-SE configuration - does not support scaling. Instead, service continuity depends on the existence of initialized standby virtual services on the surviving SE. These are capable of taking over with a single command. Avi Vantage’s default HA mode is elastic HA N+M mode, which starts each virtual service for the SE group in a non-scaled mode on a single SE. In such a configuration, failure of an SE running non-scaled virtual services causes a brief service outage (of those virtual services only), during which the Controller places the affected virtual services on spare SE capacity. In contrast, a virtual service that has scaled to two or more SEs in an N+M group suffers no outage, but instead a potential performance reduction. The default for scaling is manual. This may be changed on a per-SE-group basis to automatic scaling, which allows the Avi Controller to determine when to scale or migrate a virtual service. By default, Avi Vantage may scale out or migrate a virtual service when the SE CPU exceeds an 80% average. It will migrate or scale in a virtual service if the SE CPU is under 30%. The Controller inspects SE groups on a five-minute interval. If the last 30 seconds of that 5-minute interval is above the maximum or below the minimum settings, the Controller may take an action to rebalance the virtual services across SEs. The Controller will only initiate or allow one pending change per five-minute period. This could be a scale in, scale out, or virtual service migration.